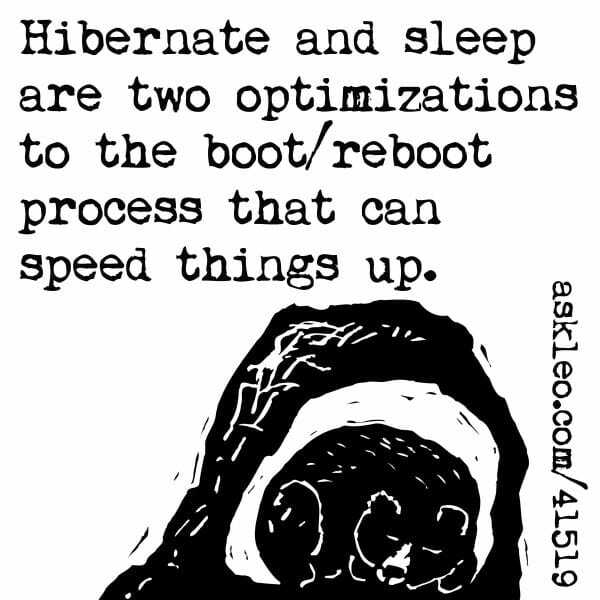 Hibernate and sleep are two optimizations to the boot/reboot process that can speed things up. - Ask Leo! Hibernate and sleep are two optimizations to the boot/reboot process that can speed things up. What’s the Difference Between Hibernate and Sleep? - Hibernate and sleep are two optimizations to the boot/reboot process that can speed things up. Did My Boot Defragmenter Tool Actually Fix My Boot Problems? - A bad sector on your hard drive could be causing strange intermittent problems. I'll show you an easy way to find out. « Previous post: Do I Need These Microsoft Visual C++ Redistributables?